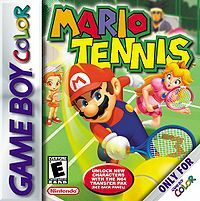 This article is a short summary of Mario Tennis (Game Boy Color). Take your game to the next level in Mario Tennis with 3 fun-packed modes! Practice control on your swings and shots in Exhibition Mode. In Mario Tour, create your own tennis player on three different save slots. Begin your tennis career as a rookie at the Royal Tennis Academy, where coaches share their sage advice and the students are all about winning. Gain experience by training and playing matches, then divide those points across stats for spin, power, control and speed. This page was last edited on 27 September 2014, at 01:41.